At 14,000 feet above sea level a "rest" day in the village of Pheriche is critical to acclimatization. It may look like one is just relaxing there, but the body is kicked into overdrive make adaptations to the lower air pressure at high altitude. 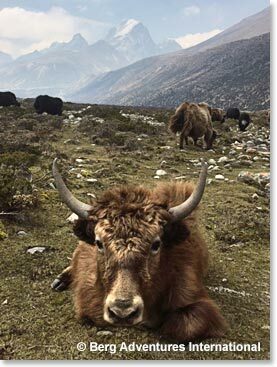 There are always plenty of yaks at Pheriche. 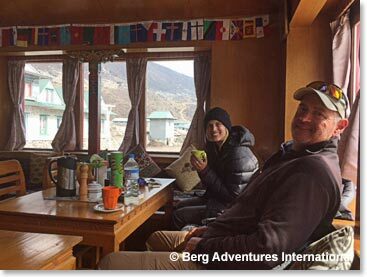 Spending two nights at the Himalayan Lodge in Pheriche has been a great experience for our climbers and trekkers for more than 25 years. The same family has always run this lodge and we have always loved staying there. The building has changed from time to time over the years - in fact, it was almost completely destroyed in the earthquake one year ago this week! But, as you will see in the photo below the rebuilding was very successful! 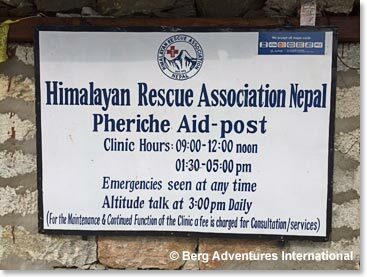 We love that the Himalayan Lodge is located next door to the Himalayan Rescue Association clinic. The HRA clinic has operated in Pheriche since 1974. What a historic place it is in the annals of adventure travel, high altitude trekking and climbing! The HRA clinic has served trekkers, Sherpas and porters for decades. The HRA clinic is simple, but staffed by knowledgeable physicians. 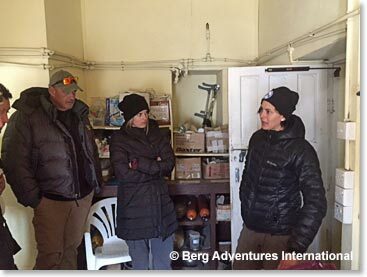 Here Garv and Kylie get some advice and information on acclimatization from the doctor.